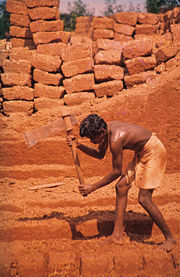 Cutting laterite brickstones in Angadipuram, India. Laterite (from the Latin word later, meaning "brick" or "tile") is a surface formation that is enriched in iron and aluminum. Found mainly in hot, wet tropical areas, it develops by intensive and long-lasting weathering of the underlying parent rock. Laterite formations in non-tropical areas are products of former geological epochs. Some laterites are valuable for their ore content. Some hardened varieties have been used to build houses, roads, and other structures. In addition, solid lateritic gravel may be found in aquaria where it favors the growth of tropical plants. Nearly all kinds of rocks can be deeply decomposed by the action of high rainfall and elevated temperatures. The percolating rainwater causes dissolution of primary rock minerals and a decrease of easily soluble elements such as sodium, potassium, calcium, magnesium, and silicon. As a result, there remains a residual concentration of more insoluble elements—predominantly iron and aluminum. In the geosciences, only those weathering products that are most strongly altered geochemically and mineralogically are defined as laterites. They are distinguished from the less altered saprolite, which often has a similar appearance and is also widespread in tropical areas. Both types of formation can be classified as residual rocks. The process of laterite formation has produced some valuable ore deposits. For example, bauxite, an aluminum-rich laterite variety, can form from various parent rocks if the drainage is most intensive, thus leading to a very strong leaching of silica and equivalent enrichment of aluminum hydroxides, chiefly gibbsite. Laterites consist mainly of the minerals kaolinite, goethite, hematite, and gibbsite, which form in the course of weathering. Moreover, many laterites contain quartz as a relatively stable, relic mineral from the parent rock. The iron oxides goethite and hematite cause the red-brown color of laterites. Laterites can be soft and friable as well as firm and physically resistant. Laterite covers usually have a thickness of a few meters, but occasionally they can be much thicker. Their formation is favored by a slight relief that prevents erosion of the surface cover. Lateritic soils form the uppermost part of the laterite cover. In soil science, they have been given specific names, such as oxisol, latosol, and ferallitic soil. A very iron-rich nickel limonite or nickel oxide ore at the surface contains one to two percent Ni bound in goethite. It is highly enriched due to very strong leaching of magnesium and silica. Beneath this zone, nickel silicate ore can be formed, frequently containing more than two percent Ni that is incorporated in silicate minerals, primarily serpentine. In pockets and fissures of the serpentinite rock, green garnierite can be present in minor quantities, but with high nickel content—mostly 20-40 percent. It is bound in newly formed phyllosilicate minerals. All the nickel in the silicate zone is leached downward from the overlying goethite zone. Absence of this zone is due to erosion. Laterites are economically most important for ore deposits, such as bauxite. In addition, strong, hardened varieties of laterite are sometimes cut into blocks and used as brickstones for building houses. Khmer temples in Cambodia were often constructed of laterite, but by the twelfth century, Khmer architects had become skilled and confident in the use of sandstone as the main building material. Most of the visible areas at Angkor Wat are of sandstone blocks, with laterite used for the outer wall and for hidden structural parts that have survived for over 1,000 years. Hardened laterite varieties are also applied for the construction of simple roads (laterite pistes). Nowadays, solid lateritic gravel is readily put in aquaria where it favors the growth of tropical plants. Golightly, J.P. 1981. Nickeliferous Laterite Deposits. Economic Geology. 75:710-735. Schellmann, W. 1983. Geochemical principles of lateritic nickel ore formation. Proceedings of the Second International Seminar on Lateritisation Processes, São Paulo. pp. 119-135. All links retrieved Jume 21, 2018. This page was last modified on 21 June 2018, at 21:01.